Our customers are the best gift we can ask for. 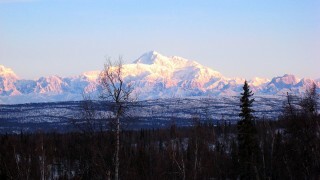 As 2010 dawns, we look forward to continuing to provide you with the best children’s gear in the State of Alaska. Thank you for your continued patronage. May the blessings of health and happiness be yours in the coming year. PS-My brother-in-law, Rick Boots, took this picture of Mt. McKinley last January on a snow machine trip out of Petersville. Our normal store hours are 10 to 6 Monday through Saturday, however, we will be open from 9 to 4 on Christmas Eve, closed December 25 through the 27th and will reopen at 10 AM on Monday, December 28. ALL CHRISTMAS T-SHIRTS, SOCKS, SWEATERS, AND DRESSES ARE 40% OFF! Christmas sleepwear for boys and girls including robes, pajamas, nightgowns and slippers. Junior Towne offers complimentary gift wrapping as well as GIFT CERTIFICATES for the perfect fit. Reopening at 10AM on Monday, Dec. 28. Thank you to all our loyal customers for a terrific year. We are well blessed to have you as part of our Junior Towne family. At Junior Towne we know that a silent (or relatively quiet) night is one of the best gifts a parent can receive. A restful sleep can be very elusive for a new parent so we have a variety of products to help out. The Sleep Sheep by Cloud B has four soothing sounds to help children sleep-mother’s heartbeat, spring showers, ocean waves, and whale songs. The Co-Sleeper (both original and mini) connects to an adult bed and allows mothers to breast feed while still in bed. Gripewater, new to the United States but used by Europeans for the last 100 years, is a mixture of fennel and ginger, helping settle little tummies on colicky babies. The world’s most pediatrician-recommended swaddler, the Miracle Blanket, combines two of the most effective solutions to calm a fussy baby: classic swaddling and the lateral belly wrap. 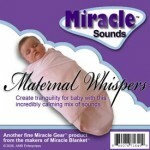 The same company also makes a highly effective CD, Maternal Whispers, for getting baby to sleep. So sweet dreams and good night! Merry Christmas! Remember that we are open this Sunday from 12:30 PM to 4-complimentary giftwrapping as always! Since I have two boys, one of the fun parts of Christmas is selecting cute presents for little girls. One of our hottest brands is Haven Girl, maker of fashion forward clothing full of sparkles that girls love. We have a good selection of tops, skirts, leggings and dresses embellished with sequins and rhinestones. The Manhattan Toy Company has outdone itself with its Groovy Girl collection with even a nod to our Alaskan notoriety with its dogsled accessory, Mushtastic. For a little bit quirky gift, see our selection of FuzzyNation wristlets, purses and plush puppies. Mudpie has come up with a couple of adorable piggie banks in a number of sizes to fit any pocket book. The gift that every little girl must have is a musical jewelry box. We have the traditional ballerina and a new horse box with additional drawers for tucking away special jewelry. Come see us soon-remember we have complimentary gift wrapping and are open special Christmas hours from 12:30 to 4 on Sunday, Dec. 20. We have collected a series of stocking stuffer suggestions out side the normal. 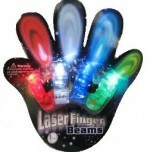 They are designed to provide laughter, inspire the imagination and/or just provide a whole lot of fun. 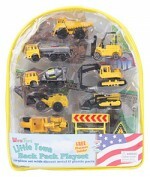 Our first in the series is targeted for boys as they can be really tough to buy for. Enjoy and remember, we have complimentary gift wrapping! Of special note is Arnold the Snoring Pig. He sounds just like Someone I Know and is sure to put you in hysterics. Just a reminder- our normal store hours are 10-6 Monday through Saturday. However, we will be open this Sunday (December 20) from 12:30 to 4 PM for your Christmas shopping convenience. PS- We still have a great selection of robes, pajamas and nightgowns! Go to sleep under a starry sky! 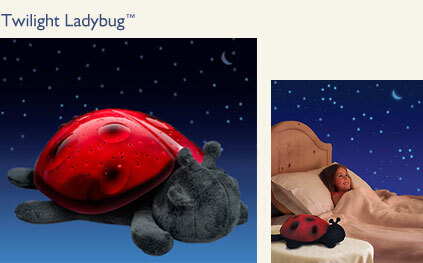 We have just received a shipment of the award-winning Twilight Turtle and Twilight Ladybug. These critters make bedtime fun for children of all ages. Constellation nightlights are the perfect bedtime companions for our long Alaskan nights. Also just in are Sleep Sheep (plush sheep with four soothing sounds), Lavender Lab (aromatherapy blend helps calm children to sleep) and the Polar Cuddle Cub (plush toy shivers to provide comforting touch.) These toys are winners of the Top Toy and iParenting awards and make perfect Christmas presents-we’ll even wrap them for you! We had lots of fun with Star the Reindeer and Santa on Saturday afternoon. 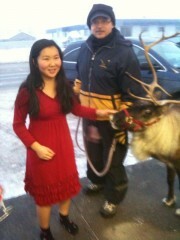 This young lady was trying on Christmas dresses and ran outside to greet the reindeer. Only in Alaska! 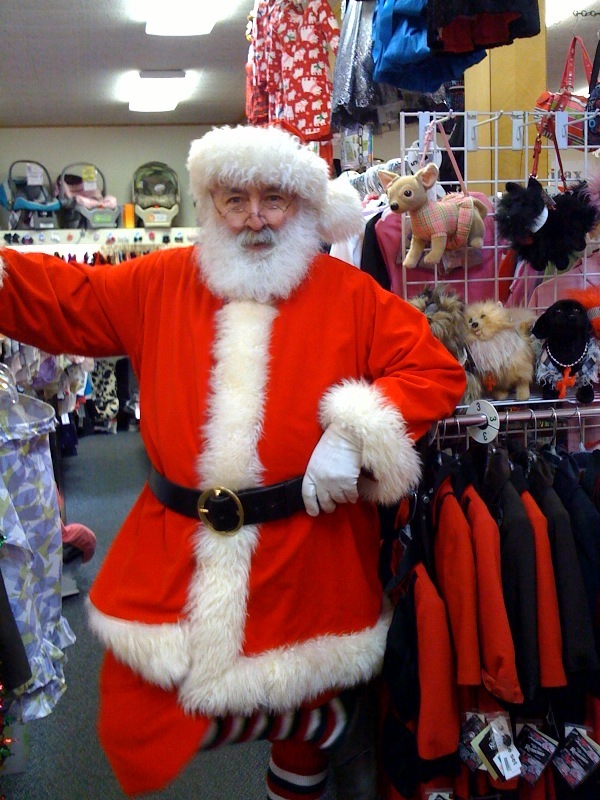 Santa will be visiting us on Saturday, Dec. 12 from 4 PM to 5:30 PM. Bring your camera for candid shot and a candy sleigh for each child. We The Spenard merchants have gotten together for lots of activities. We have even heard rumors that Star, the reindeer will be wandering the neighborhood! 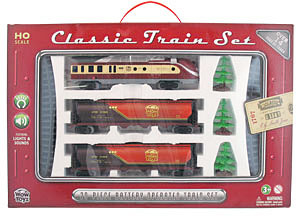 Make an Ornament, Blaines, free all day. Carolers through out the day. Please remember that we are collecting mittens, hats, socks and winter gear for those in need at North Star School. If you purchase for donation and leave it with us, we will give you a 40% discount on the item. Have some fun in Spenard-same town, different attitude! You are currently browsing the Junior Towne Blog weblog archives for December, 2009.